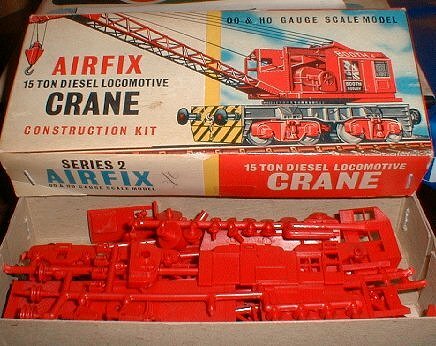 The Airfix model of this 15-ton Diesel Hydraulic Crane is fully operating and is made from 79 detailed parts. The boom and crane are raised and lowered by means of the key provided. They turn through a complete circle, the crane platform is mounted on a pair of 4-wheel bogies. Correct transfer markings are included and the kit is in two colours, wheels black, remainder authentic red. Choice of coupling is supplied dummy scale or "Buckeye".